Even if we think sin is harmless,scripture tells us it puts us in jeopardy of losing eternal life that is promised to us if we are obedient to following after righteousness (Romans 6:10-16). 10 For in that he died, he died unto sin once: but in that he liveth, he liveth unto God.11 Likewise reckon ye also yourselves to be dead indeed unto sin, but alive unto God through Jesus Christ our Lord.12 Let not sin therefore reign in your mortal body, that ye should obey it in the lusts thereof.13 Neither yield ye your members as instruments of unrighteousness unto sin: but yield yourselves unto God, as those that are alive from the dead, and your members as instruments of righteousness unto God.14 For sin shall not have dominion over you: for ye are not under the law, but under grace.15 What then? shall we sin, because we are not under the law, but under grace? God forbid.16 Know ye not, that to whom ye yield yourselves servants to obey, his servants ye are to whom ye obey; whether of sin unto death, or of obedience unto righteousness? Jesus healed many people,but it was when a certain man who had an infirmity for twenty eight years and not only was he healed but told to go and sin no more lest a worse thing come upon him (John 5:5-9,14). 5 And a certain man was there, which had an infirmity thirty and eight years.6 When Jesus saw him lie, and knew that he had been now a long time in that case, he saith unto him, Wilt thou be made whole?7 The impotent man answered him, Sir, I have no man, when the water is troubled, to put me into the pool: but while I am coming, another steppeth down before me.8 Jesus saith unto him, Rise, take up thy bed, and walk.9 And immediately the man was made whole, and took up his bed, and walked: and on the same day was the sabbath. 14 Afterward Jesus findeth him in the temple, and said unto him, Behold, thou art made whole: sin no more, lest a worse thing come unto thee. We are given life more abundantly through believing on Christ,and by doing so sins temptations are not as enticing for we know the outcome by living in it!We must press on in patience having faith in the one who endured the cross to save our soul’s! (Hebrews 12:1-4). Wherefore seeing we also are compassed about with so great a cloud of witnesses, let us lay aside every weight, and the sin which doth so easily beset us, and let us run with patience the race that is set before us,2 Looking unto Jesus the author and finisher of our faith; who for the joy that was set before him endured the cross, despising the shame, and is set down at the right hand of the throne of God.3 For consider him that endured such contradiction of sinners against himself, lest ye be wearied and faint in your minds.4 Ye have not yet resisted unto blood, striving against sin. 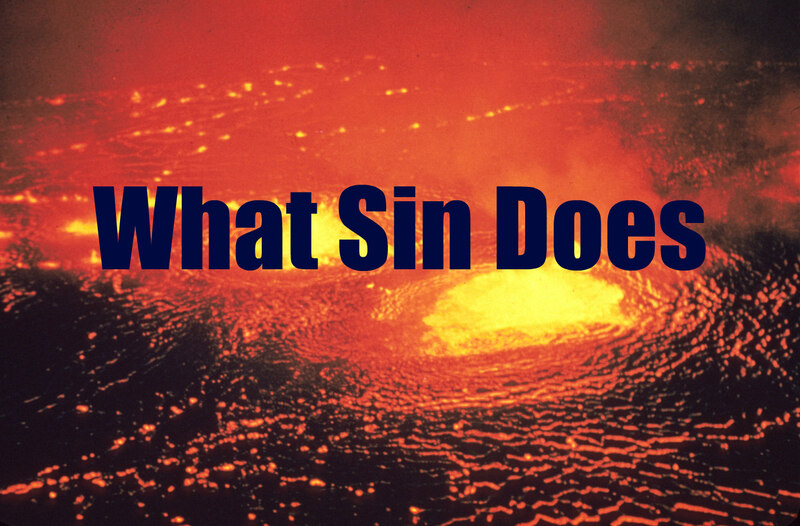 Sin separates us from God and unless we repent we will be separated from Him for all eternity! (Isaiah 59:1-8). Isaiah 1:16-2016 Wash you, make you clean; put away the evil of your doings from before mine eyes; cease to do evil;17 Learn to do well; seek judgment, relieve the oppressed, judge the fatherless, plead for the widow.18 Come now, and let us reason together, saith the Lord: though your sins be as scarlet, they shall be as white as snow; though they be red like crimson, they shall be as wool.19 If ye be willing and obedient, ye shall eat the good of the land:20 But if ye refuse and rebel, ye shall be devoured with the sword: for the mouth of the Lord hath spoken it.